The Rebel Alliance symbol looks great next to all that money. 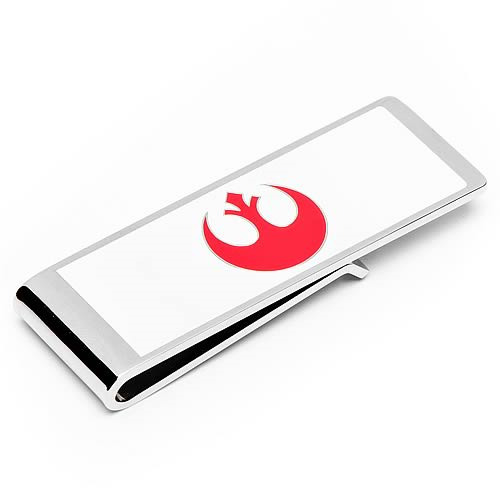 Class up your style while simultaneously holding your cash secure with the help of Star Wars and this excellent Star Wars Rebel Alliance Symbol Money Clip! All of the Rebel fighters in the Rebel Alliance would want to show their love for the resistance, so they totally would have kept their petty cash in check with this awesome money clip, and if it's good enough for the only folks in the Star Wars Universe actively trying to subvert the Galactic Empire, then it's good enough for you. The Rebel Alliance symbol would look great holding all of your greenbacks! You can really flaunt your fandom when you pay for stuff and whip out this excellent Star Wars Rebel Alliance Symbol Money Clip. The money clip measures about 2 1/2-inches long.